The Riverside Rebel track and field squad continued to find more success at the Burlington Invitational Saturday with athletes and relay teams placing high in their events. The Rebels placed fourth in Burlington with 56.5 points, 14.5 points behind Wind River and just a half-point ahead of Dubois. The Lady Rebels placed eighth with 24 points, four points behind Dubois and 16 points ahead of St. Stephens. 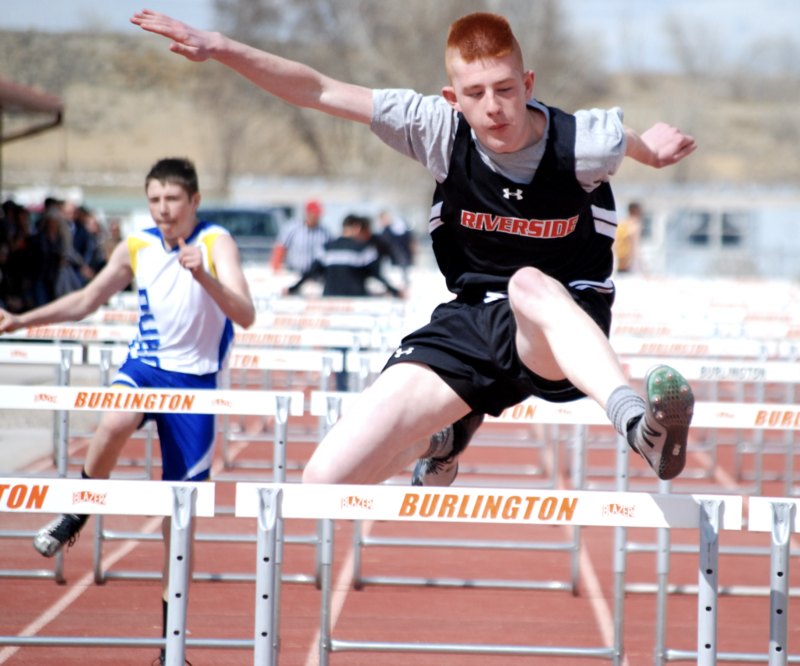 Riverside senior James DesRosier powers over the hurdle at the Burlington Invitational Friday. DesRosier placed sixth in the event with a time of 18.81 seconds. In individual results, sophomore Cody Thompson won the 3,200-meter run, finishing the event in 14:07.09. In his first time in the event, freshman Nathaniel Boreen placed second in the pole vault by clearing 9-9. “Nathaniel did pole vault for the first time and put up a great mark,” Collingwood said. Senior James DesRosier had a strong meet in Burlington. DesRosier placed third in the 400-meter dash, finishing the lap in 56.4 seconds, and fourth in the 200-meter dash, finishing the half-lap in 25.52 seconds. He also placed sixth in the 110-meter hurdles with a time of 18.81 seconds. Freshman Garret Ellis-Rudd put up a strong meet in Burlington. Ellis-Rudd placed third in the 300-meter hurdles, coming in at 47.58 seconds, and fourth in the 110-meter hurdles, coming in at 17.81 seconds. He also placed fourth in the triple jump, jumping 35-6½, and in the high jump, clearing 5-6. Junior Ryan Miller placed seventh in the 200-meter dash, clearing the half-lap in 26.99 seconds, and sixth in the triple jump, jumping 30-9½. He also placed eighth in the long jump, jumping 15-1. Freshman Sterling Chavis placed seventh in the 800-meter run, clearing the two-lap race in 2:54.22. Sophomore Cash Duncan placed seventh in the triple, jumping 29-9½. Junior Jordan Mautz placed 10th in the long jump, leaping 14-1. Freshman Griffin Zapata placed sixth in the shot put with a throw of 34-1½, and 10th in the discus with a throw of 83-7¼. “I was happy with some of our throwers including Griffin on continuing to improve his shot and disc,” Collingwood said. The 3,200-meter relay team of Duncan, Miller, Boreen and Mautz won the event with a time of 10:37.91. Sophomore Breanna Riley placed fourth in the 100-meter hurdles, coming in at 18.71 seconds. Freshman Jersey Streitz placed sixth in the 100-meter hurdles, coming in at 20.81 seconds, and 11th in the long jump, leaping 12-2. Breanna and Jersey both have a chance to lower their hurdle times and I feel that with some time in practice we can get Bre to a 17 and Jersey to a 19,” Collingwood said. “Those would be marks we would like to be at. Freshman Eva Stone placed in the top ten in both of her events. 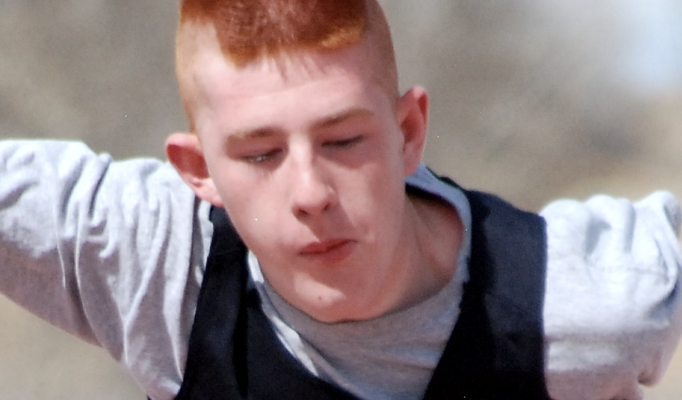 Stone placed sixth in the 400-meter dash, finishing the lap in 1:13.84, and ninth in the long jump, leaping 12-3½. Junior Summer Riley placed 11th in the 100-meter dash, crossing the finish line in 14.27 seconds. The 1,600 sprint-medley relay team of Reid, Stone, Summer Riley and Breanna Riley finished the event with a time of 5:10.06. The Rebels will compete at the D&D Invitational today (Thursday) in Worland at 4 p.m. and the Lovell Invitational Saturday at 9:30 a.m.